The Gentleman Crafter: World Card Making Day...Cards Revealed! Please join me over at Graphic 45 blog today as they reveal some cool cards crafted by the amazing paper artist, Maiko Miwa and myself in honor of World Card Making Day 2012 which is officially this Saturday! Now I'm not the best card maker, but I do try real hard and hope you like them. I totally love to make my cards a bit different from the norm. I will let you decide if I succeeded! First up, is the Graphic 45 Ladies Diary card I did for Graphic 45's booth at CHA. This paper collection is plain old amazing and it wasn't hard to make a card that shows off this gorgeous collection. For details and more pictures, please visit Graphic 45's blog today....And don't forget to check out Maiko's Amazing card while you're there! Thanks so much for coming by to visit! Jim these are both stunning! I love them both, but the Bird song one is over the top amazing. 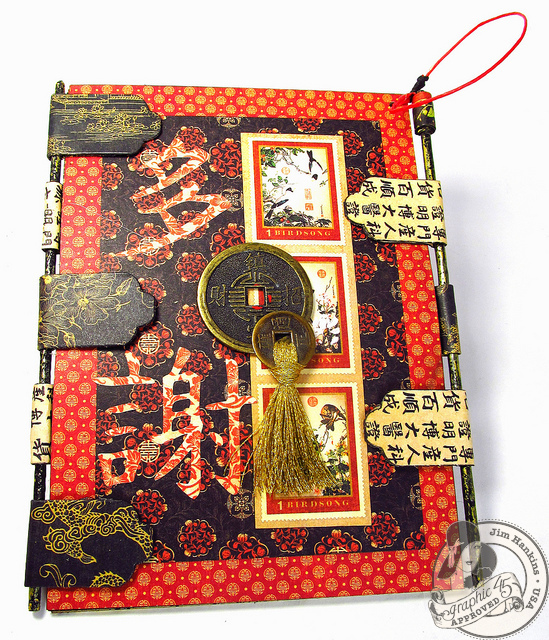 The bamboo closure and hinge are very cool. Thank you for sharing. These cards are fabulous. You have to quit being so coy about your cards. I know we said we would get together and work cards, but I don't think I can teach you anything! You know it, you have the MOJO! You exhaust me with your profusion of projects that you can get done in a day! LOL. Keep up the awesome work. 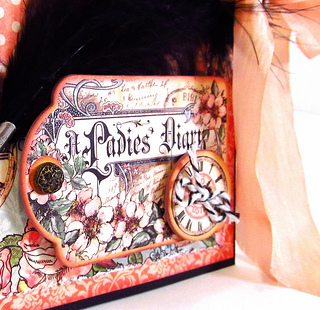 BTW - I want to know how you did the binding on the Ladies Diary card!! 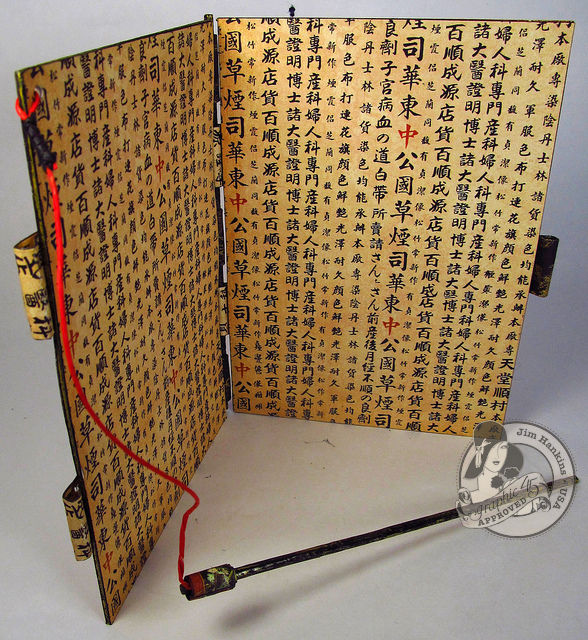 The binding consists of little 1-inch strips. I alternated folding the strip over the skewer and then on the front, one on the back, one on the front and so on. 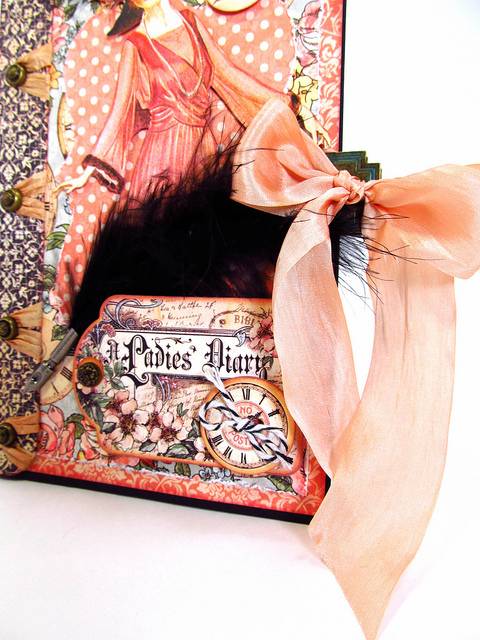 I hid the binding strips on the Ladies Diary card with the cover papers. Does that make sense? Hope so....BTW, hope you are feeling better! Thinking about you! Jim, you rock! As far as I have seen there isn't any craft you are not good at. You've got the touch. And yes these cards are outside the norm. Success! Oh Thanks Sharon! :) Happy Friday! Donna, thanks tons! I just look at the other DT members for G45 when they make cards and I'm just gobsmacked! SO I'm a little wary of showing mine! LOL! I can't make a card to save my life so when I see cards like yours, I'm completely amazed at what you make. I just love the hinges! Nice, nice job, Jim! 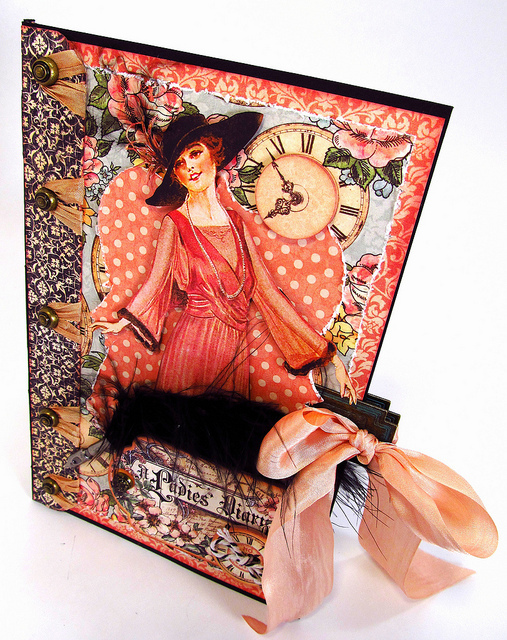 I am a card maker and am always amazed by the many and varied marvellous cards that I see crafters have made. Yours are 2 examples of just that. I love the different approach you have with your work . . . . . very unique! I am also amazed by the amount of projects you create. If only I was half as productive. Well done! Wow, Jim! Love them both! Your style shines through on both of them. I will stop by tomorrow and see what you guys are up too. I plan to make tea and spend the day making cards! Thanks for sharing and inspiring me. I plan to use the Graphic 45 paper I got after seeing your Nutcracker piece, and can't wait! They look fabulous! You always throw a unique twist into everything you do, awesome! You did great! Love em both! Jim, these cards are so true to your delightful style. I love them! 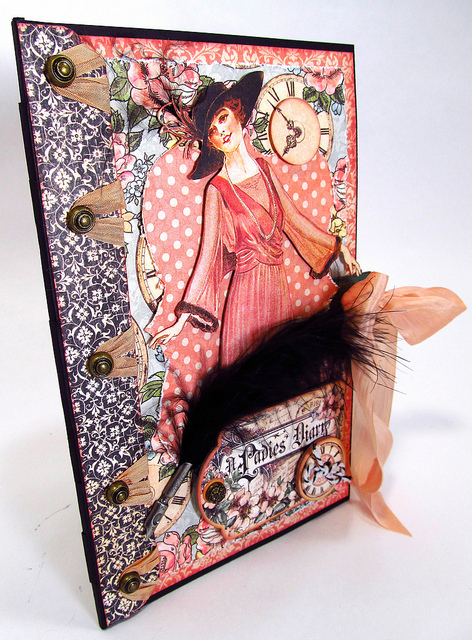 I laughed at the black feather with ladies diary because that is my go to embellishment for that collection. What a great way to kick off National Card Day! Jim, these are just stunning! I love them! The use of the ribbon in the first card is over the top amazing. Thank you for sharing. really beautiful cards. I love them all. AMAZING, You can send me a card anytime Jim! 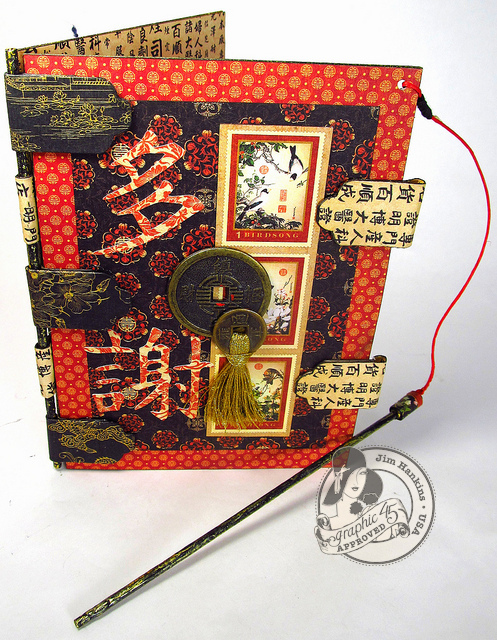 Love the hinges and the peg to keep it closed (Wow) I'm off to Graphic 45 to check out the details. You SUCCEEDED!!! They are beautiful! I saw those cards ... WOW !! I love what you did, the details, the ribbon, the closure, my goodness so awesome ( I gotta find another word... I say this so often)! Not a card maker ?! SUCCEEDED !! Awesome job Jim! Card making may not be your favorite, but you pulled this one off with the best of them :) Love your closure idea on the Ladies Diary card ~ very cool (yes, I know I am dating myself saying that, but oh well lol. Hope you are enjoying your trip! OUTSTANDING. LOVE LOVE LOVE the Japanese one. Those hinges and all of the detail. Yummy. I don't know why you are so coy about your cards Jim - they are stunning! You always include so many interesting details in your work - there's something new to admire each time we look at them. I just don't understand how you manage to be so prolific when all of your work is so beautifully detailed - it would take me weeks to make just one of your creations! BEAUTIFUL cards, Jim!!! I wish I couldn't make cards like you can't...LOL!!! Absolutely gorgeous cards - you are amazing!!! You knocked both of these out of the park! Wish you'd give us a tute on how to tie a good bow - your's are always perfect. Have a wonderful time getting inky(er) - looking forward to you sharing when you get back. Is there anything you can't create? These cards are just marvelous! I love the fussy cutting on Ladies Diary, and the hinge/closure on Birdsong is great. I've been sick all week, so these are a real pick me up! Outstanding cards Jim. Love your style. Ladies Dairy card is just stunning and the Bird Song is just gorgeous. I visit daily and wait eagerly for your next post and your next unique project. Jim, just loved your cards and whatever gave you the idea you can't craft them as magnificently as your other endeavors?! I was very impressed with the clasp on the "Birdsong" card and your use of layers on the "Ladies Diary" card was as good as it ever gets! Thanks for so much inspiration tonight! Where did you ever get the idea that you are not a good card maker? You rank right up there with the best. Fantastic work, Jim! All I got to say is, if you are not a great card maker, I am a salamander!